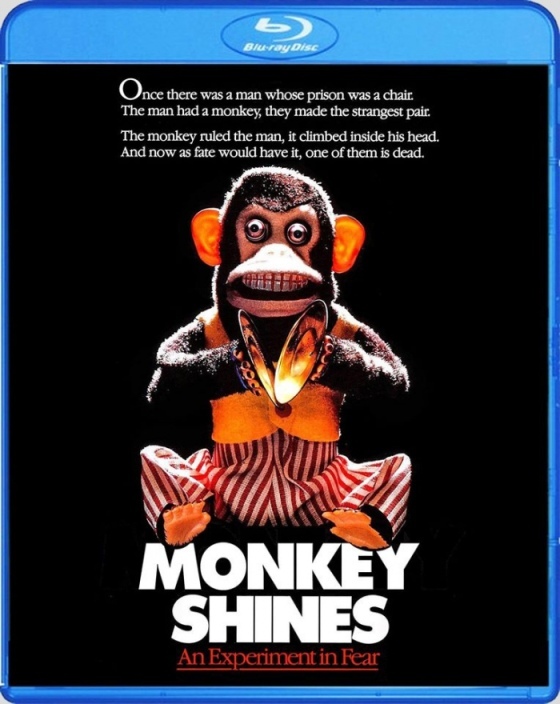 Schlock-Wire: Scream Factory Loads Up A George Romero Blu-Ray Double Shot For November With MONKEY SHINES And THE DARK HALF – Schlockmania! This fall, Scream Factory will release The Dark Half and Monkey Shines, two horror favorites from acclaimed director George A. Romero. Making their Blu-ray debuts on November 18th, 2014, each release also boasts brand new bonus features including all new audio commentaries with George A. Romero, new retrospective featurettes with cast and crew, behind the scenes footage, deleted scenes and much more! In addition, fans who order their copies from ShoutFactory.com will have their order shipped three weeks early! Allan Mann (Jason Beghe) is a bitter, angry and vengeful man ever since an accident left him paralyzed from the neck down. He’s fed up with himself and everyone around him. All that changes when he’s given Ella, a monkey trained to meet his every need. But when Ella begins anticipating Allan’s thoughts, strange and deadly things start happening. And as she stalks and wreaks havoc on Allan’s fair-weather girlfriend (Janine Turner), incompetent doctor and meddling mother, Allan realizes he must stop the cunning maniacal creature…before she fully takes over his mind! Monkey Shines stars Jason Beghe (Chicago Hope), Janine Turner (Northern Exposure), Stanley Tucci (The Devil Wears Prada), Kate McNeil (The House on Sorority Row). Based on the best-selling book by Stephen King, The Dark Half tells the story of horror writer Thad Beaumont (Timothy Hutton), who hopes to distance himself from his murder novels and from George Stark, the name he has used to anonymously author them. To achieve this, he cooks up a murder of his own: a publicity stunt that should lay Stark to rest forever. But when the people around him are found gruesomely slain – and his own fingerprints dot the crime scenes – Beaumont is dumbfounded until he learns that Stark has taken on life of his own…and begun a gruesome quest for vengeance! The Dark Half stars Timothy Hutton (Leverage, Ordinary People), Amy Madigan (Field of Dreams), Michael Rooker (The Walking Dead) and Julie Harris (The Haunting). Fans can pre-order their copy now at ShoutFactory.com. Shout! Factory will continue to present the on-going SCREAM FACTORY™ home entertainment series in 2014 with specific release dates, extras and key art. Meanwhile, fans are encouraged to visit the Scream Factory website (www.screamfactorydvd.com), follow them on Facebook (www.facebook.com/ScreamFactoryDVD) and Twitter (@Scream_Factory) or to view exclusive video content on YouTube (http://www.youtube.com/user/ScreamFactoryTV).